State Department Recommends Removing Cuba From Terror List : The Two-Way President Obama said the State Department completed its review. The AP and Reuters are reporting that the department has recommended removing Cuba from the list of state sponsors of terrorism. 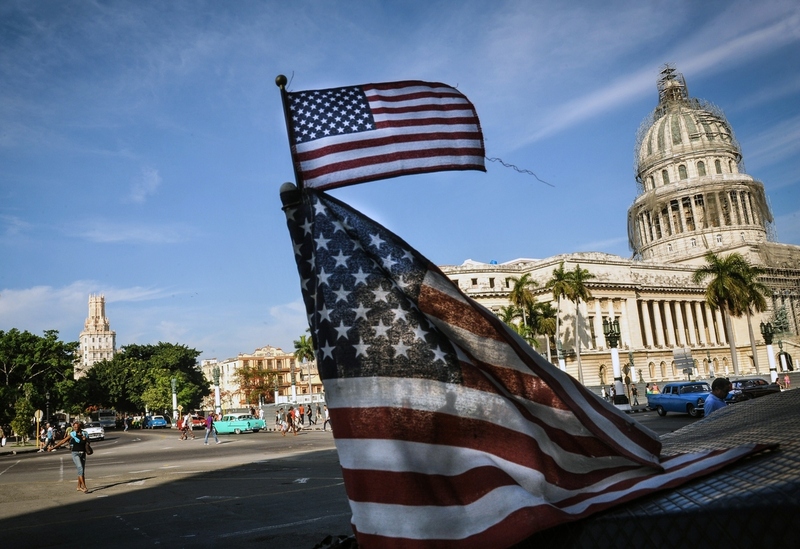 U.S. flags are seen in a bici-taxi near the capitol in Havana in January. The State Department has recommended that Cuba be removed from the U.S. list of state sponsors of terrorism, Sen. Ben Cardin, a ranking member of the Senate Foreign Relations Committee, said in a statement. Cardin said the recommendation "is an important step forward in our efforts to forge a more fruitful relationship with Cuba." President Obama ordered a review of Cuba's place on the list when he and Cuban President Raúl Castro announced that after more than five decades of estrangement, both countries were ready to normalize diplomatic relations. President Obama, who will meet with Latin American leaders, including Castro, at a summit in Panama starting Friday, now has to make a decision on the recommendation. If Obama accepts it, he has to notify Congress and Cuba would be removed from the list 45 days later. As the news broke, the State Department announced that Secretary of State John Kerry would also meet with his Cuban counterpart, Foreign Minister Bruno Rodríguez Parilla, in Panama tonight. That will be the highest level meeting between the two countries in decades. U.S. officials had expressed hopes that they could open a U.S. embassy in Havana and a Cuban embassy in Washington by the time the Summit of the Americas kicked off tomorrow, but the process was delayed, in large part, by an inability to find a bank willing to handle the accounts of Cuba's diplomatic missions in Washington and New York. Cuba, which has been on the state-sponsors-of-terror-list since 1982, always insisted it did not deserve to be on it. During recent high-level negotiations, Cuban diplomats said their removal from the list was paramount to full normalization of diplomatic relations with the United States. The list includes other countries like Iran, Sudan and Syria. In its most recent report issued in 2014, the State Department said Cuba was on list because it has provided support and safe haven to paramilitary groups like the Revolutionary Armed Forces of Colombia (FARC) and Basque Fatherland and Liberty (ETA).